Four-time champion Tiger Woods will miss the Masters after having surgery on a pinched nerve in his back. The world number one missed his usual warm-up, the Arnold Palmer Invitational, because of back spasms. "This is frustrating, but it's something my doctors advised me to do for my immediate and long-term health," said the 38-year-old American. "It also looks like I'll be forced to miss several upcoming tournaments to focus on my rehabilitation." Woods, who will be absent from the Masters for the first time in 19 years, won his maiden Augusta title in 1997 and also claimed the Green Jacket in 2001, 2002 and 2005. A statement on the 14-time major winner's website said the surgery was a success but he had failed to "make the necessary progress" to play at Augusta and would need rest for the "next several weeks". It's hard to imagine a Masters without Tiger Woods. For nearly two decades he's been ever present and invariably contended. He hasn't won at Augusta since 2005, and his inconsistent form this year didn't suggest much likelihood he would add to his four previous victories, but there is little doubt the inevitable buzz that his mere presence generates will be sorely missed. The process of recovering from back surgery poses huge questions. How many more majors will he miss in this a year where the venues promised so much? Further down the line, will he make it to the Ryder Cup? And perhaps most pertinent of all, is there any chance that this 14-times major champion can ever again be the force of old? Woods added: "I'd like to express my disappointment to the Augusta National membership, staff, volunteers and patrons that I will not be at the Masters. "It's a week that's very special to me." 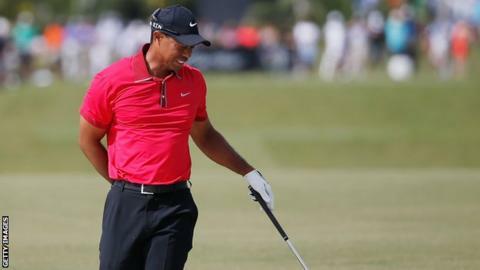 He has suffered a string of injuries since 2008, missing two Opens, a US Open and a PGA Championship, but he has been present for every Masters since making his debut as an amateur in 1995. Woods still trails Jack Nicklaus's record of 18 major titles, while Sam Snead won a total of 82 PGA Tour titles compared to Woods's current total of 79. "It's tough right now, but I'm absolutely optimistic about the future," said Woods. "There are a couple of records by two outstanding individuals and players that I hope one day to break. "As I've said many times, Sam and Jack reached their milestones over an entire career. I plan to have a lot of years left in mine." Nicklaus responded, saying: "I am sorry to hear that Tiger will miss the Masters. "I know Tiger has been working very hard to return to form, and as I have said many times, Tiger has a lot of years of good golf ahead of him. "I hate to see him robbed of some of that time by injury. But we all know he is doing what is in the best interests of his health and future. I wish him well on a speedy recovery." Billy Payne, chairman of the Augusta National Golf Club, said: "Tiger was gracious in keeping us updated of his condition and making us aware of his decision. "We wholeheartedly offered our best wishes for his immediate and long-term recovery. Tiger will be in our thoughts and will be missed by our patrons and all of us at the Masters next week. "He is one of our most decorated champions and we look forward to his healthy return in 2015 and beyond."